Digital Transformation isn’t simply one solution… it’s the solution to many needs and challenges, it’s about business outcomes. The pace of change is rising exponentially and customers expect exceptional experience across all touch points. Companies that embrace digital capabilities transform themselves so they not only survive, but thrive in the new economy. Sirius has embraced digital capabilities at our core, ensuring you benefit from our depths of expertise. Because the digital transformation journey is never-ending, you must be ready and willing to accelerate change in order to grow. Every company is on its own unique journey and can have multiple levels of maturity that vary by industry segment and geography. Our experts use the Sirius Digital Maturity Model to help identify where your business is currently, and how you can advance your digital transformation to ultimately reach your vision. This stage ensures leaders from various departments (such as marketing, sales, supply chain, IT, etc.) have a common understanding of the aligned strategies and are working toward common goals to serve customers leveraging digital technology. 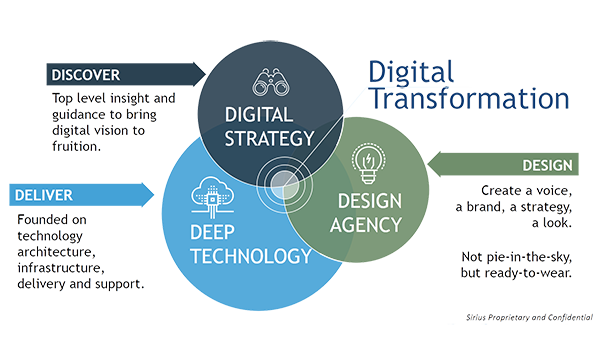 One of the first steps is establishing priorities and developing a road map that details the stages of digital transformation. This stage focuses on customer experience and behaviors. Do you have the right digital platforms to help grow your customer base and improve interactions? Commerce, digital content management, and social monitoring platforms are foundational investments in this stage. Analytics provide more insight into customer patterns, which allow you to better target messaging, promotions, etc. Additionally, no digitally powered business can ignore security. The Sirius methodology inspects and considers all aspects of digital security, starting in this phase and throughout the rest of the journey. Stage two is about engaging your customers. Do you offer excellent, seamless interactions with them across all communication channels? A mobile-first design mentality, consistency of products and promotions, more personalized company interactions, and a single 360-degree view of the customer are key to reaching this maturity level. On the more mature end of this stage, companies are better at anticipating customer needs through personalized recommendations. This stage represents a fundamental shift from digital business as a part of a marketing strategy, to digital as the core of your business. Organizations in this stage are moving beyond designing a mobile experience, to creating a connected experience. 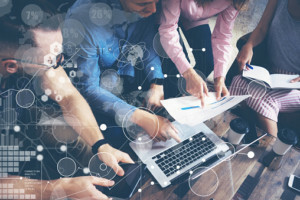 The connected experience is about designing a consistent and seamless customer journey across all company interactions—from web to mobile to smart devices (IoT or Connected Everything). 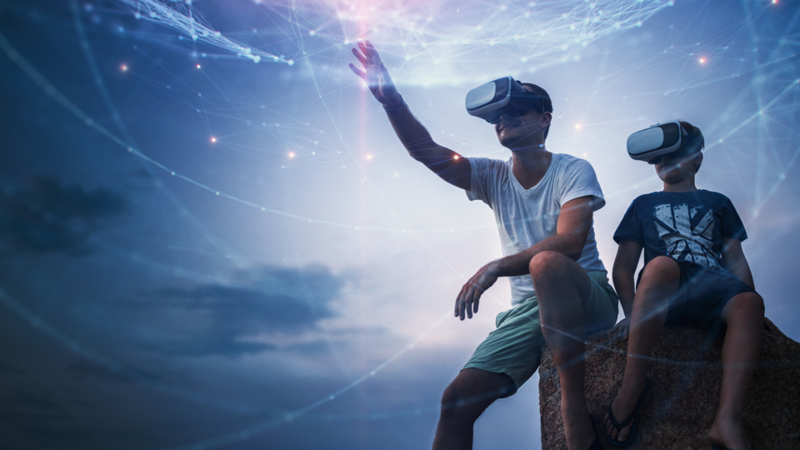 This stage also includes smart interactions such as leveraging artificial intelligence and cognitive analytics to anticipate customer needs and respond more effectively. This stage may also include ideation around new business opportunities, which allows your enterprise to enter exciting new markets. Get the conversation started. Contact us to learn more about the digital transformation journey and how we can help your business’ longevity in the digital space. At Sirius, we combine thoughtful, strategic vision with the creativity of a design agency, all built on the foundation of deep technology expertise we’re known for. Our experts focus exclusively on different digital areas, ensuring that we offer the best expertise in each. Contact us to get started on your Digital Transformation journey.